Mary Vando was attracted to MassArt’s Fashion Design Certificate program for its reputation and experienced professors. 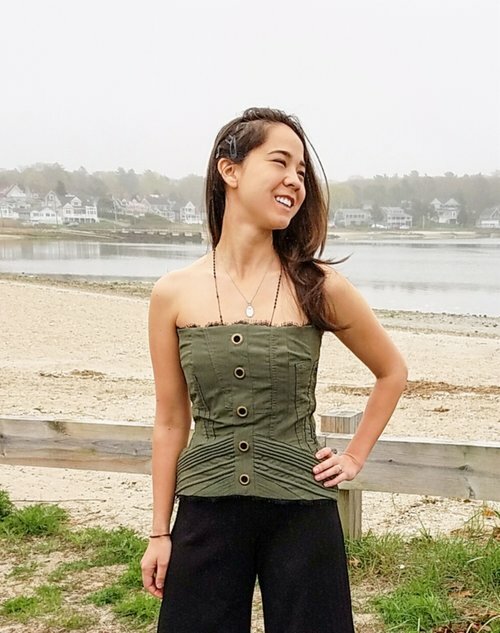 Mary says, "I went into the program wanting to make pretty clothes, I came out wanting to make a positive impact in the world through design." Her purpose as a designer was guided by not only technical and creative education, but also by studying topics such as Sustainable Fashion and Art and Fashion. Mary’s "goal is to design fashion that is thought out, has intention, and is purposefully crafted." Much of Mary’s work centers on themes of sustainability. Mary believes that "Design tells you something deeper than the outward appearance; it’s a statement, commentary, inspiration, lesson; it points to beauty and truth. Beauty not always being defined by what is pleasing to the eye, but also the message of hope in a tragic scene; the glimpse of love in a troubled world; the faith, or courage, or joy in the midst of suffering or injustice."